The future Frs. Seraphim and Herman began publishing in 1965 a beautiful new bi-monthly publication The Orthodox Word which influenced me as young boy. 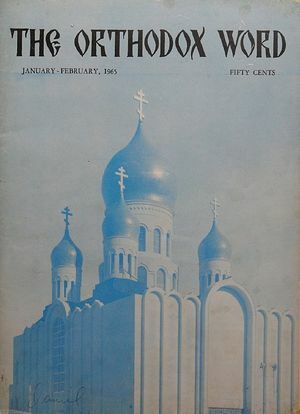 As a teenager in Canada I read about the appearance of this journal in another Orthodox periodical and there was an offer that the first one or two issues would be sent free of charge. I immediately wrote and asked and received the first two issues for free. I then subscribed to it, and then you continued to send it to me free, which I thank you for! Compared to all other Orthodox publications of that time this new publication was so beautifully printed, on quality paper, with excellent illustrations of icons and saintly persons. The various jurisdictions printed journals which were dry and unappealing but The Orthodox Word was so appealing. It was a delight to read the lives of the saints and particularly about the not-yet-canonized Fr. Herman of Alaska, who was the patron of the brotherhood and the heavenly protector of Orthodox America, and about miraculous icons, holy places in North America, and defenders of the Orthodox faith, and so on. It was there also that we read about the perils of the ecumenical movement and other contemporary heretical movements and trends. I always impatiently waited for the next issue because it introduced readers to the Patristic approach to theology, emphasizing the importance of reading the lives and writings of the Holy Fathers of the Church, and seeking answers to contemporary issues in their Patristic consensus, which expresses the mind of the Church. I remember being particularly moved by an article by Bp. Ignaty Brianchannivov of nineteenth century Russia called “Christians You Must Know Christ.” The early missionary endeavors of Frs. Seraphim and Herman, their publishing work, and their witnesses to the saintliness and miracles of Abp. John who reposed in 1966 produced an indelible impression on my personal life. From my early youth I longed to devote my life completely to service in the Church. However, it was not clear to me then how I should go about this. Without them realizing it, Frs. Seraphim and Herman and their brotherhood helped me, a young Canadian boy, living on a farm in the middle of nowhere in Alberta, to gain a clear picture of how i could begin bringing my dreams to fruition and to fulfill my heartfelt desire to serve the Church. One day in 1965 the third issue of The Orthodox Word arrived and on the back there was a write-up about the theological seminary located at the Holy Trinity Monastery in Jordanville and as I read this short advertisement a great desire rose in my soul like a flame to study there. I realized that was where I needed to go and nothing would stop me, God-willing. I was inspired also by the holiness of St. John and by the unwavering witness of the Russian Church Abroad to the unchanging Traditions of Orthodoxy. I wanted to be part of a Church which produced such a saint and stood unswervingly in the defense of Christ’s Truth in an apostate world. It was then that I came to know Bp. Sava of Edmonton who was a very close friend of Abp. John and a compiler of accounts of his miracles. During my visits to Bp. Sava he related to me the many miraculous events surrounding St. John and he assisted me in applying to the Holy Trinity Orthodox Seminary where I finally arrived on the eighth of November 1967. 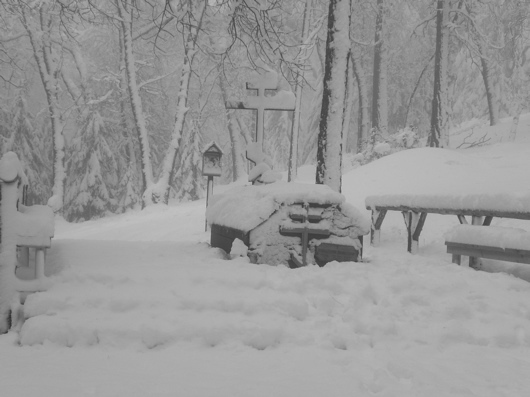 It was the first snowfall. I continued to reside there and study as a seminarian and then became a monk living in Jordanville for seventeen more years. I thank God for His many mercies to me and for allowing me to have met holy and spiritually-gifted people like Bp. Sava, Fr. Seraphim Rose, the many righteous and humble monks who have struggled through the years and continue to struggle for their salvation in this monastery and in the monastery in Jordanville, and in all monasteries. In conclusion, let me stress that my meetings in person with Fr. Seraphim were too brief and too fleeting. I was however immediately impressed by his humility, kindness, discernment, and his peaceful spirit. 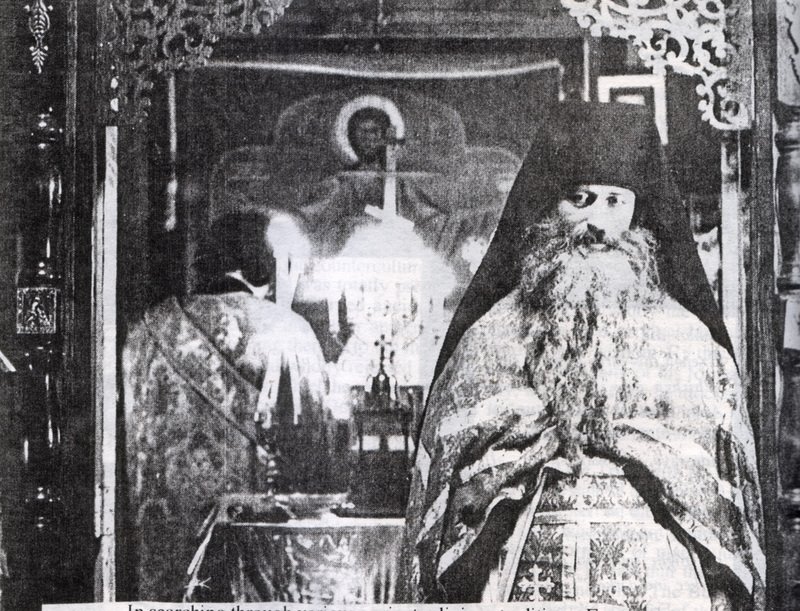 Several times when I was editor of Jordanville’s English-language journalThe Orthodox Life I exchanged letters with regard to burning issues in the Church and ideas expressed in the Church prayers with Fr. Seraphim. But Fr. Seraphim influenced my life immensely in another way, through his inspired and timely writings, through is prayers, and through his personal example as a man who had discovered the truth in Holy Orthodoxy and who had devoted his life to the very end to proclaiming this truth to the world. Indeed, our loving God has given us during these troubled and unstable times a teacher and witness of His saving grace in the person of Fr. Seraphim Rose of Platina. Today we celebrate the thirtieth anniversary of his blessed repose. May his memory be eternal. 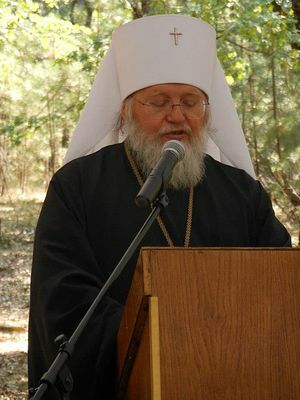 May he continue through his life and writings to inspire and enlighten seekers of the truth to find shelter and a safe haven in the ark of salvation, the holy Orthodox Church of Christ, and may God ever bless this monastery and may it be a source of salvation for many generations to come. Amen. Mary lived and labored daily at St. Herman’s Monastery for several years in the late 70’s until Fr. Seraphim’s repose, and thus was in a position to come to know him better than most, and to be of one Spirit with him. This is the first time I’ve come to the monastery in many years and it’s been a rather emotional time. I do happen to remember Met. Hilarion’s visit here, I think in 1977. I remember when he left Fr. Seraphim said, “He’ll be a good bishop.” I think that Fr. Seraphim would be very pleased with this gathering, not because we’ve come to honor him but obviously those who have come have made an effort and value the faith, and for him that was very precious, and anyone who showed that kind of interest in the faith somehow encouraged and uplifted him. I also think that he would be very pleased by the monastic spirit and seriousness and sobriety combined with joy that is so evident now in this monastery. Unfortunately during Fr. Seraphim’s time he had very few people who were mature enough to have gained much from him. He would try and help people but the monastery has really grown and blossomed and glory to God for all things. I’d like to give you some history of how I ended up here. I was raised in an Orthodox family but my attitude as I grew older was, “Save me O God, but not yet.” I just wanted to have my time in the world. In 1973 I was traveling out west and someone told me about a Christian commune on the coast and I had read about the Jesus Freaks and thought it was interesting and I had no plans so I went to visit. My heart was struck immediately and I felt that God was telling me to be more serious and I felt that if I delayed I may never hear that voice again. This was basic, Evangelical Christianity but I saw that they had given God their hearts, and that’s what God wants. In the Russian parishes in which I had been raised the faith is sometimes a cultural appendage. When my mother heard about this she was frantic and she told me to go get Abp. Anthony’s blessing, so I went to see him and I told him about this Protestant commune. He told me to go to the services that night for St. John of Kronstadt and if I still felt the same then I could go. And I thought God’s ways are so mysterious—who would ever have thought that an Orthodox archbishop would give such a blessing? But that’s how God worked it out. It was a commune of 60-100 people living together and it was there that I met Solomonia and we became very good friends. Once when we were back home visiting our parents she came to visit us at Jordanville where she was baptized and on the way back we stopped at Novo-Diveevo. My mother had great veneration for Abp. Andrew and one of the nuns who knew my mother and had been the spiritual daughter of St. Seraphim Sobolev said that if we really wanted to meet good missionaries we must go and see Fr. Seraphim and Fr. Herman. In Jordanville when Solomonia was baptized one of the founders, Archimandrite Panteleimon told us to go back and convert our Protestant friends! So that was our plan and another monk said we should go to a specific convert parish, but when we returned to the commune they gave us a serious talk and I felt the rug ripped from under me, and maybe that it was only my own will wanting the Orthodox Church. It’s difficult because Christ talks about leaving your father and mother, and for me that was Orthodoxy, so I was thinking maybe I was there just for them, so we stayed two more years in this Gospel Outreach group. There was more spiritual turmoil but I felt that God would at some time show us what to do, and eventually we got the blessing of the elders to leave. By that time I had already had another meeting with Abp. Andrei and he had invited Solomonia and myself to come back to Novo-Diveevo and be his spiritual children. That was our plan, but while we were waiting for our replacements to come to the commune we decided to borrow a car and go visit Fr. Herman and Fr. Seraphim. We heard they were quite strict with few women visiting. We started up the dirt road and we thought maybe we had made a wrong turn but we got out to stretch and see the view, and down comes this jeep and a man with a long beard and he was just looking at us, and we imagined he’s thinking, “Oh, look at these two fruitcakes come to visit us,” but he just said “the monastery’s further up.” It was actually the eve of St. Herman’s November feast day, but we had had no idea. It was also the eve of the Apostles’ Fast and so he was going down to town to get mayonnaise and ice cream and everything we could possibly eat before the fast on the morrow. I was still very nervous thinking they might turn out to be some kind of kooks and what if God is closing a door? But as soon as I started speaking to them I completely realized that here was a rock—here was real Orthodox Christianity—the essence of Orthodoxy that I’d been hungering for. I had two talks that weekend with Fr. Seraphim. We talked up to Whispering Pines and I told him that during our time in Gospel Outreach God had arranged that for Pascha I could get to an Orthodox service and one was at the parish where we had been recommended to find a good home with English and many converts. I went there with high hopes and told Solomonia that if I felt that was our place that was where we were going to go, blessings from the commune elders or not. But I came back almost devastated, thinking this was another door shut. Something was off and I couldn’t quite put my finger on it but I knew this was not it. I told Fr. Seraphim that I visited there and he asked what I thought and for a split second I thought what if they’re good friends and I have some kind of criticism? But I thought it’s better to be honest, and he was delighted! Apparently that was a classic crazy convert extreme parish that later went off with the zealots. He was working at that time on the correctness disease, which I had no idea what it was, but he saw that I felt that and he was glad that at least we understood that. The second talk we walked down the hill and I said that one of things that saved me from leaving Orthodoxy was the New Martyrs and the witness of those in Russia who were suffering for the faith, and I told him that I thought suffering was important, and as you all know he always was a great believer that suffering is very important in the spiritual life, and so that also pleased him. At that time they suggested that we both spend Great Lent here to get our Orthodox feet. We knew nothing about the services or anything and they knew that Novo-Diveevo would be difficult for us because we had come from this very active group and Novo-Diveevo was mainly elderly nuns with an old-aged home. We were just thrilled! At that time there were only Frs. Seraphim and Herman here and little Gleb who was ten or so. We had come at a very difficult time in the monastery, as Fr. Damascene has written in his book, when all the monastics or people who were here had left gradually for one reason or another and so there was no one and it was a little bit discouraging from them. They didn’t get a lot of feedback from The Orthodox Word and we came hungry wanting to help them in any way we could, and God’s timing was just wonderful. If there had been a lot of other brethren it would have been awkward and I don’t think we could have stayed but as it was we were able to help singing on the kliros, in the kitchen, doing errands, some manual things, to free them to do their important work. After Great Lent we were dreading that our time was getting close and just after Pascha Fr. Seraphim called us have a talk in the teepee (someone had given them a real Indian teepee), and we thought he would ask us to leave, but instead he asked us if we could stay and help with Russia’s Catacomb Saints. And we were just thrilled! And of course we never left. That summer of 1977 a number of young men came up, including the future bishop George who was a novice then, and they held the first New Valaam Academy with certificates, which was primarily listening to tapes of Fr. Seraphim’s Survival Course, which was just phenomenal. As it became clearer that we had no plans to leave they bought the piece of property in Wildwood and by then another friend from Gospel Outreach had become Orthodox and they took us all out there and told us to start building and so we spent that summer in sleeping bags under the stars. It rarely rains in the summers so we cooked with a camp fire and got water from the stream below. Fr. Seraphim would come and direct us as to how build and we were hammering away and built the first little house there. Then Mother Brigid came and moved there to begin a more monastic lifestyle and I didn’t quite fit in there. Fr. Seraphim took me down to Redding and we had a meeting with Fr. Alexey who was publishing a little journal called Nikodemos, but with his priestly duties it had become too much for him and they thought maybe this was the time to expand it, patterned afterPravoslavnii Rus’ out of Jordanville, but instead of Orthodox Russia it would be Orthodox America. Fr. Seraphim gave me the obedience of working with Fr. Ambrose and our first issue was in July 1980. At that time I had an electric typewriter and I was living out of a backpack, working on it in various places, whether in Etna with Solomonia or in Redding just so I could use electricity but obviously that wouldn’t work long-term. Towards the fifth or sixth issue they gave me some keys for a trailer they had found in the town of Platina, so that’s where I settled and continued, leaving in 1995. I would come up the hill pretty regularly, certainly before Fr. Seraphim’s repose, and even afterwards for a year or two. In 1983 I was fortunate to go to Russia and at that time Orthodoxy and the Religion of the Future had already been translated and Fr. Seraphim’s name was already known and I took in The Soul After Death and Russia’s Catacomb Saints and at that time you didn’t know if you’d get in with them or not but I made it in. 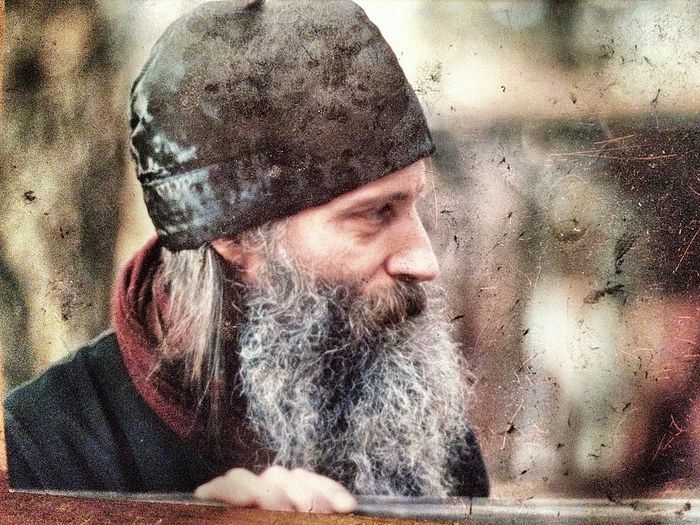 I met the hieromonk there who was responsible for publishing Fr. Seraphim’s Orthodoxy and the Religion of the Future in samizdat and he was also disseminating Abp. Averky’s works. I went to Pskov and there was a young novice at the gates and he heard that I was from America and his first question was, “Do you know Fr. Seraphim Rose?” I saw Fr. John Krestiankin come out of church and pilgrims surrounded him and I had a photograph of Frs. Seraphim and Herman by the well taken in June of 1982 and I gave it to him and asked for them to pray for the brotherhood. About Fr. Seraphim himself, it’s hard to know what to add after reading Fr. Damascene’s monumental tome. Fr. Seraphim bore the name of St. Seraphim of Sarov who said, “Acquire the spirit of peace and a thousand around you will be saved,” and Fr. Seraphim was peaceful all the time. He recommended to his children to keep an even keel. When I first arrived I was in seventh heaven and so excited and I knew that the pearl of great price was here. I had no questions, which now I regret—I could have asked Fr. Seraphim more, but I thought everything would come in time and I was just so satisfied here. He has this calm and non-judgmental attitude. He was very unaffected and unassuming. Fr. Herman thought we might be scandalized by how it looked. It looked nothing like it does now. There were some dilapidated buildings and the east wing came later and the church was never finished. But Solomonia and I had been living in this communal situation with ten people to a room with barely electricity and plumbing so we weren’t scandalized at all but thought it was pretty normal. The main thing to me was the spiritual life here and their calmness. He was so focused and disciplined. You could tell he was all into his work and it filled him. It was wonderful and you just wanted to help them. All he wanted to do was some kind of ground teem and sow like St. Seraphim said. 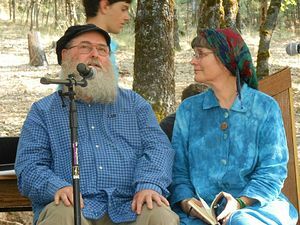 He just wanted receptive ground to any seeds he could plant, and everyone who came to him he tried to discern where he was in his spiritual life and what he could give that person—what that person was interested in or what his talents were and how he could help him develop to be a fruitful Orthodox Christian and down to earth and practical. 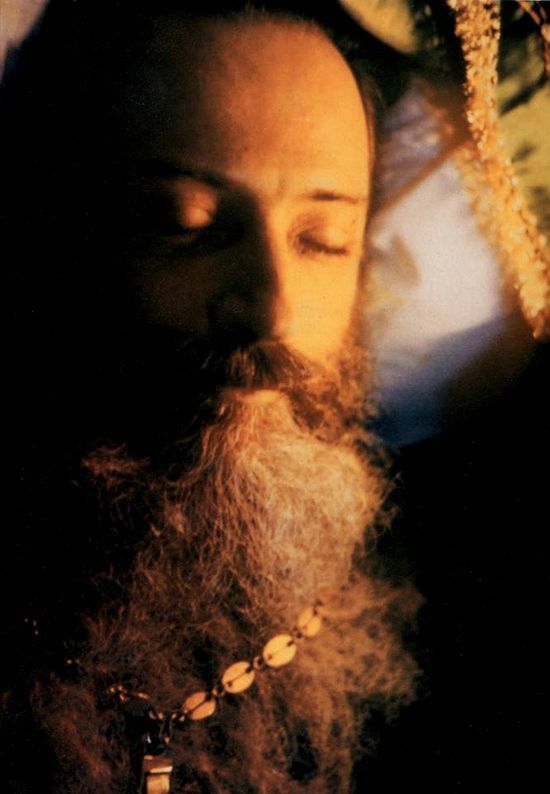 He saw too many converts getting very enthused about prayer ropes and icons and incense and reading Holy Fathers that were really above their level and he was always in his sermons and writings trying to develop a loving heart, which was more important than everything else. If you have that you can go on from there, but so many in the modern world don’t have that and they want the spiritual fruits before they have the real foundation. He had a lot of integrity. He was very direct in what he said. The truth was very important to him and there was a truthfulness about everything he said and I think that’s why he was drawn to Dostoyevsky. I just happened to pick up Dostoyevsky’s Concept of Spiritual Regeneration and it spoke to me of Fr. Seraphim. He could have easily have written something like that. Dostoyevsky had the idea of truth, honesty, and suffering and that was so much a part of Fr. Seraphim. He also had a very gentle manner. After Confession his hand was very light on your head, and yet he was very direct. He wasn’t soft. He gave you some direction, but he was very gentle. He was very self-disciplined I think. You saw that his temptations didn’t come from the world. He didn’t have any interest in it and after his reading his biography I can see why. He was more working on himself and on his humility. He said to keep an even keel when I was flying high, Once I was humming to myself and he said, “Well, what will you do when things get bad?” So many people go up and then flat down and give up. I couldn’t see myself ever coming down, but things did get rough, but us women had more stick-to-it-iveness and we didn’t care. But he said always keep an even keel, small steps one at a time. You don’t’ have to go flying up to any heights. He also taught us to feel sorry for others rather than to judge them. One of his godchildren had gone to Jordanville and was ready to give up there but he wrote to him and said, “Don’t judge others how they would use their time.” Be responsible for your own. Another advice he gave to me particularly was to think before you speak. He very much liked the idea of being self-sufficient on the land. I was living out in the woods and there was a chance for a little garden and he asked if I wanted any tomato plants and he gave us some compost. He was really into it. For his August name’s day we picked a lot of blackberries and we thought we should make some jam and he was ready to get all the canning equipment to make it all. He loved the ability to be self-sufficient. There was one winter where the monastery was snowed in for two weeks and he was just delighted. While we were here there were few visitors. It was a difficult trip but later they got some young men who really wanted to commit themselves. Fr. Seraphim was really considerate. Every evening when we left to go the guesthouse after evening prayers he asked if we had enough candles and firewood. He was so unassuming. He did it in such a way not to draw credit to himself but out of genuine kindness and genuine care. The first spring we were here Solomonia and I were sent to dig with a pick axe. We didn’t know it but there were roots of poison oak and I’m extremely susceptible to that and I was covered and Solomonia had it worse. It got to the point where my face looked like a mongoloid lizard with ooze and crust and it was really bad. Fr. Seraphim went into town and came back with every imaginable ointment and lotion. I had new skin by Pascha so that was alright. He always thought about others that way. I’m glad that they published the CD of his lectures because his pictures give the impression that he had a small, quiet voice. People tell me that they’re surprised by his voice, but it’s good because he was a natural teacher. When Fr. Herman would go off to town and Fr. Seraphim would sit in his place at trapeza and give some kind of little teaching, it was always something practical. We always wished we had a tape recorder but never did. His singing voice was very prayerful. There was nothing affected about it and it was just tender. I particularly remember the Bridegroom Services. Those services always bring me back here. They have the custom which they took from Bp. Nektary which he got from Optina I believe, that just before the singing of the Exapostilarion, Fr. Herman would be in the altar and he took off his sandals and we gathered all the lampadas from the narthex and brought them to the deacon’s doors and the curtain was closed and the church was in total blackness. Then Fr. Seraphim stood in the middle and Fr. Herman, without anybody seeing, would open the doors, and the altar was a blaze of light with the lampadas and candles everywhere. And Fr. Seraphim began singing in a voice you would never forget “I see Thy bridal chamber adorned O my Savior,” and there it was all adorned. When the doors closed after the third time of singing it we were like Adam weeping outside of Paradise. It was very moving. Fr. Seraphim loved the first week of Great Lent. He was usually on kitchen duty then and we ate dates and figs and very desert-y food. He was very energetic in his bows at “O God cleanse me a sinner.” It was hard to keep up with him. He was quite tall and making them quite fast. They took out all the rugs for Great Lent and it really gave a wonderful feeling. 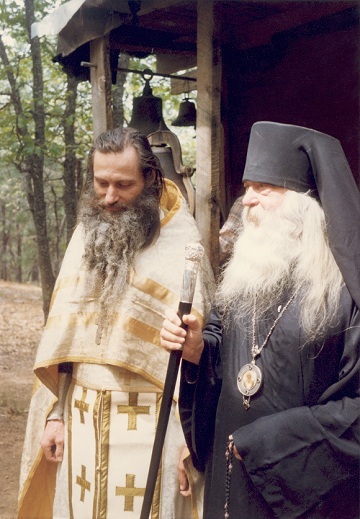 This was before the Lenten Triodion had been translated, and he was on the left kliros as canonarch and we were on the right, and he would be translating from the Lenten Triodion on the spot from Slavonic to English and we would then sing what he gave. That was amazing. He never said, “I’ll be praying for you,” or anything like that but you knew. There were several times where it was only later that I realized that it was Fr. Seraphim’s prayers that gave me calmness. One time there was many visitors on the weekend and we were on kliros. He was a priest by this time. It came time for the Cherubic Hymn and I just couldn’t find the music. Fr. Seraphim came out and I explained to him, and he just said, “Well, can you do it?” He made the sign of the Cross and we did it by memory and it came out alright. Solomonia and I had an old Chevy pickup truck and once we were asked to go to some preparatory meetings for the millennium of Orthodoxy in Russia to sell some Orthodox Words and some books, and it was in a town quite far from here. I got to Red Bluff and something was really wrong with the truck so I stopped at a mechanic and he said I could lose a major part at any time. I didn’t know what to do and there’s no phone to call Fr. Seraphim. It was too long for them to fix it so I drove all the way back to the monastery. He said, “Well, do you think you can do it?” I felt such a peace about it, and I was very nonchalant and said, “Sure, I’ll go.” I realized later it was because of his prayers that somehow I knew I would be alright, and the trip went without incident. There were some difficult characters that used to come up here who they tried to help, although not always successfully. One man with some problems came who could be violent at times, and he was to go to the psychiatric ward in the hospital and we were asked to drive him. Fr. Seraphim asked if I was afraid and I again felt this peace. I knew that if I were asked by him to do something then I needn’t be afraid. Again, it went without incident. He had in incredible amount of patience. Gleb reminded me of Mowgli, the little boy raised by wolves. He had very little in the way of social graces. They tried to take him into town and show him a few things, but it was not easy. One of the Optina elders says you should be like a wheel, always going up, but with one little point always on earth, and Gleb was that point that held Frs. Seraphim and Herman down to earth—being forced to deal with this growing teenager. Fr. Seraphim spent hours patiently teaching him. Once we were at Mrs. Harvey’s in Redding and Fr. Seraphim asked Gleb to call the store to ask their hours, and Gleb picked up the phone and just said “OPEN? !” Another time we were returning from San Francisco and we stopped at a truck stop for food and Gleb ordered eggs and the waitress asked how would you like them, and Gleb just said “cooked.” Fr. Seraphim said, “Well, over easy, scrambled, etc.? He had a lot of patience and a lot to do there. Fr. Seraphim stressed that there was no formula for salvation. So many of us want something pat we can do—do this and that and say so many Jesus Prayers and fast on Wednesdays and Fridays and you go to Heaven. He understood the subtlety of spiritual life and he conveyed that—that it’s always a struggle. I can see now, especially after reading the biography, that he was such a brilliant man, and how he was able to work on and preserve humility, and how his life in that respect was a true voluntary martyrdom. Although he and Fr. Herman were supposed to live in obedience to one another, Fr. Seraphim always took the lower seat. Spiritually that would be very difficult I think, and is what really drew him to the heights that he attained. I was asked how he preserved this humility with being a writer and all, and from what I can understand, he always had the example of the righteous ones. He didn’t think he was doing anything special. He was just following in their footsteps and they were always above him, so he had no reason to be proud. What he accomplished was truly extraordinary as we all know now, but he always kept himself from thinking about himself. He had such esteem for those righteous ones like Bp. Theophan the Recluse, who inspired him. All he hoped for was to be continuing in that Tradition. He didn’t think he was starting anything new. God also preserved him in that until he died there weren’t crowds of people usually. There were occasional visitors, because it’s difficult to come up here. In that respect he was given enough encouragement to not become discouraged, but he was able to really preserve that humility which was so striking in him. I think that’s pretty much what I remember. Thank you. Solomonia also lived and worked at the monastery with Mary, also coming to know Fr. Seraphim quite well and to gain much spiritual profit from him. It’s been twenty-eight years since I’ve been here and it’s wonderful to see so many people here that have come to love Fr. Seraphim as we do. It’s always been amazing to me over the years to hear about his popularity and I would always think, “But they don’t know him! What are they receiving, what are they seeing? They never were in his presence,” and I guess it’s really a witness of God’s grace, that God has allowed people to have very real sense of Fr. Seraphim. He was a very gentle and consoling person and in his role as a priest that was such a gift to have, to be instructed by him, to be taught the services by him, and to see his love for the services. I had only been Orthodox for a year and hadn’t really experienced much of the Church at all and so my experience here was really what gave me my whole foundation for Orthodoxy and it was Fr. Seraphim’s love for the services and excitement. When a service would start it would be like going to a feast day. It was always so full and so inspired and it was the very essence of our life. He was really very, very simple: always waking up early in the morning, having the full cycle of services, eating breakfast, helping with the work of collating or transcribing or whatever and then church and then vespers and then evening prayers. There was no other place we wanted to live. We were satisfied to the fullest that we could be and it was a gift that they gave to us. I mentioned that he was very comforting, in that whenever anybody would come to him with any troubles he always had something gentle and comforting to say. There was a good friend of mine who always had a difficult life, had troubles in her personal and parish life and he was always very special. He would always tell her just to concentrate on God’s love and everything else was really secondary. Once after the evening service I went to Fr. Seraphim and told him that I was feeling burdened by past sins, and he said to me something that I always remember, even thirty years later: “If you feel condemned, you will go free,” and that has always been very special. No matter what you carry around with you, if your heart is suffering and repenting and feeling the burden of it, that’s acceptable to God and you will go free. He never spoke down to anyone. He was the easiest person to approach. It’s hard for me to approach someone of a high stature, but he was always so comfortable to be with because he was very normal, very natural, and very receptive. He never spoke to a person as if they were someone lower than him or ignorant; he was always uplifting. He was meek and yet he was very, very strong. Once, years before his fatal illness, he was in the hospital for a procedure and I went to visit him and I said “Fr. Seraphim, how are you feeling”? And he said “Oh, I’m feeling fine. They’re very nice here. They bring me juice every morning!” He just had no presumption. He was so appreciative of everything and anything that anyone would do. If you ever worked in the hospital, you know that most patients were very demanding—they want their juice on time and if they don’t get what they think is their due, they get very angry. And so, he was quite a contrast, which is a good example of his character. He was very uncomplaining, when we would have a difficulty with heat or with cold, for example. Once I drove him to do errands in Redding and it was one of those awfully hot days. It was way over 100 and I was so thirsty and it was before the age of water bottles and all sorts of niceties and I thought I was going to die of thirst, so I just quickly pulled ran into a store for some cold water and I brought some out to him and he drank it as if had I not brought it to him he wouldn’t have bothered or taken that step to ease his discomfort. He just bore it, quietly, patiently without any show, without any evidence of any problem; it was just life. When we were here there was a surge in gas prices and everyone was saying, “Oh my goodness, what are we going to do, gas prices are so high, the economy is crumbling, everything is just going to be disastrous,” and he just said, “It doesn’t matter. Whatever happens we just keep on; we just live and do whatever needs to be done,” and I think that’s good to remember in this day and age when everyone is so distressed by life in the world. He really loved when people were sincere and really sought God with a simple heart. That was very, very special to him. I remember when we set him off on the train to Jordanville. He’d never been East or traveled much at all. When he got back he told us about his journey and I thought it was interesting to note the simple things that he mentioned and shared with us. First of all, when he got onto the train and walked down the aisle his valise opened up and everything spilled on the floor and so he had to gather everything up. When he sat down a young man sat with him and was asking sincere questions about who he was and what his faith was, and for Fr. Seraphim it was very exciting to find somebody who wanted to know what was real in the spiritual world. He also mentioned that he stopped to visit a priest in Pennsylvania who had a very large family, without about ten children. Fr. Seraphim enjoyed his visit with him so much and he was very impressed because after his large family would go to sleep, the priest would go downstairs and say his prayer rule, and that’s something Fr. Seraphim took note of as being very commendable. Anyone’s simple and sincere effort in their spiritual lives was to him important. I remember when they bought the land in Wildwood for us, because us women needed a place to live, and they took us there to see it, Fr. Seraphim took me aside and asked, “Well, what do you think?” I told him I didn’t know what my path in life would be but that I wanted to stay there until I could see Orthodoxy in every aspect of my life, that my life could be fully Orthodox, and to him that was all that mattered. He didn’t want commitment or a monastic aspiration—just for a person to absorb and live an Orthodox way of life and then be able to share that. Fr. Seraphim was very sober and very serious, but he also, maybe unbeknownst to most of you, had a very sweet sense of humor. Once when I was walking out of the trapeza there was a puddle down by the front gate, and Fr. Seraphim was standing there with a pilgrim and there was a duck in the puddle, and Fr. Seraphim said, “Look,” and I looked and I said, “Oh, my,” and he said, “Hmm,” and I went closer and said, “Maybe it got separated from its flock,” and he said, “Hmmm,” and I said, “It’s not moving; maybe it’s hungry; maybe we should feed it,” and I looked at him and he was just about to burst out laughing—it was a decoy that someone had brought them, and he obviously thought it was humorous. It was very sweet. He was a very, very dear person, and when people ask me what Fr. Seraphim was like I try to tell them that he was very normal. He just wanted people to be normal because the spiritual world, as Fr. Seraphim would say, is right here in our midst. We just don’t have the eyes to see it. If we follow and read the Holy Fathers, and lead a spiritual life, and try to cleanse our minds and our hearts and to be true to God then the spiritual world is right there and we just have to accept that as a normal part of our life. It’s nothing fantastical. If someone reads the outline of Fr. Seraphim’s life and says, “Oh, he was overzealous,” or something like that, they’ve missed the essence of what he was. He was very normal, and very real, and that’s what was such a blessing and a wonderful foundation for me to have experienced here. When I was at home and I was thinking about what I was going to say, I looked at an icon that he had given me of the New Martyrs of Russia, on the back of which he inscribed, “May your inspiration be always the New Martyrs.” I think all we can do is live our normal life that God gives to us and Fr. Seraphim would want us to be ready for whatever hardships we have to endure and to keep the New Martyrs as an inspiration. There’s one last thing I wanted to share. I would do a lot of proofreading here and then take the text to the local linotype shop and then come back to the monastery with big trays of linotype, and then they would put it in the press. One day I came and I was feeling rather low that day for some reason I can’t remember, and I talked a little with Fr. Seraphim, and I went back to the guesthouse and I looked at my purse and somehow one line of linotype had ended up in my purse. I wondered how in the world that one thin, eighth of an inch strip of type ended up in my purse, and I looked at it and the words on it were, “Rejoice in the Lord always,” and I went back up the hill and I said, “Fr. Seraphim, look what I found in my purse,” and he said, “You see? !” That’s what I have to remember. Seraphim and Martha were parishioners of the Sts. Adrian and Natalie parish in Etna, CA, where served Fr. Seraphim’s spiritual child, Fr. Alexey Young, and they had many occasions to see him both in Etna and at the monastery. Seraphim has since reposed and rests in the cemetery at the St. Herman of Alaska Monastery. Martha: Fathers and brothers and mothers and sisters, it’s so wonderful to see you today. My first experience meeting Fr. Seraphim Rose was the first time I’d ever been at an Orthodox Church, which was Sts. Adrian and Natalie, which was Fr. Alexey Young’s parish. It was Pentecost and I was late for the service, but when I walked into that tiny church and Fr. Seraphim was reading the Gospel, my first impression was that I was home and I would do whatever it took. I was quite a wild person but I decided to do whatever it took to have this Christianity in my life. I used to serve with him in church and there were times that I went into the altar and didn’t even know he was in there because he was so quiet. He’d be at one far end and I would see everyone else doing what they were doing and I would vest and get ready to serve and all of a sudden I realized he was there. That made a big impression on me—that somebody that had so much to say when you engaged him in conversation didn’t need to talk and could be so quiet. As Solomonia, said he never looked down on anybody and never made them feel like what they were saying wasn’t worthwhile. That was really true because I’m sure I said some stupid things but he never made me feel like it wasn’t worthwhile. It was always worthwhile to him. Martha: When we first met him I was in my late twenties and we had several children and so being the Martha that I am I was busy with many things, with all the little kids. Because he was such a great physician of souls he could administer a treatment plan to people that was customized to their spiritual needs and so for Seraphim they had big talks. I barely had time to read a recipe so I never really read much of his books, and I was never really much about theology. I’m just all from the heart, and so for me having such a busy life with young children, just standing next to him and feeling that peace was so wonderful. I would always say stupid things like, “When are you going to lose that chunk off your beard?” Why would I say that? People ask me what was Fr. Seraphim like, and to me he was essential Christianity. He brought essential Christianity to us. Seraphim: Fr. Seraphim used to tell me not to worry about anything. He would just say, “Don’t worry about it.” I remember that: “Don’t worry about it”—but I am! It’s comforting words though. 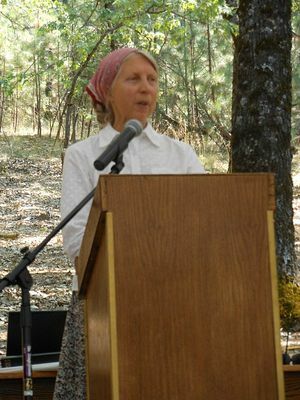 Martha: He really wanted us to keep it simple, and even now sometimes I feel a sort of despondency, in my pride thinking I haven’t done much in this life, but then I think about my husband and children and their children, and how they become Orthodox and they married non-Orthodox and brought them into the Church, and it’s very comforting to know that there is that legacy. 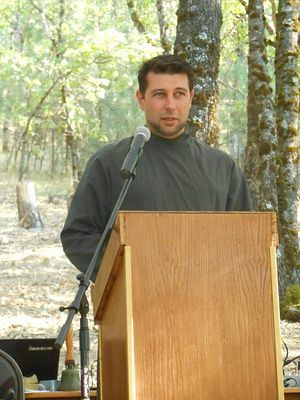 John and his wife Elizabeth had a chapel in their backyard in Woodburn, Oregon, and Frs. Seraphim and Herman would often come to serve there, in addition to their trips down to the monastery. I knew Fr. Herman first, way back in 1964 when he was an instructor at the Defense Language Institute in Monterey California and I was a soldier student learning Russian. It wasn’t until a bright, cold mid-December afternoon in 1975 that I came through those portals out here and a few yards from where I’m standing right now I met Fr. Seraphim for the very first time. The last time I saw Fr. Seraphim was in a hospital in Redding just a few hours before he reposed. In the six years and eight months that I knew him I was privileged to have a number of one-on-one conversations with this man, from which I took many things. It embarrasses me to think back on how little I knew about Orthodoxy and about life in those days, but there have been two adjectives used for Fr. Seraphim in the talks so far today: “approachable” and “patient.” But there’s another adjective that I think also applies to Fr. Seraphim, and that’s that he was calm, which I think Mary also said. He was the very personification of serenity. To put it graphically, next to Fr. Seraphim a plate of wet spaghetti looked tense. But I would like to report to you that there was one incident in which I saw Fr. Seraphim’s legendary composure slip a little. I was there, I saw it, and in fact it could be argued that I was responsible for it, but I’ll let you be the judge of that. 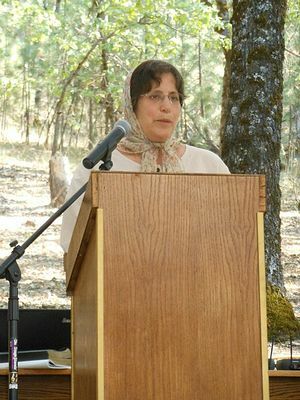 My wife Elizabeth lived for thirty-five years beginning in 1970 in a town called Woodburn, Oregon. We had a chapel in the backyard that we built ourselves. We were baptized Orthodoxy during the Dormition Fast in 1976 by Bp. Nektary of blessed memory, and about ten months later he came to our little home with the wonderworking Kursk Icon of the Mother of God. It was a beautiful day in June, 1977 and I quickly put up a kiot and we had a Moleben under the blue sky. Actually it rains a lot in Oregon so I thought it prudent to have a chapel, just like Fr. Alexey had in his yard in Etna, so I set about building a chapel which was named in honor of our Lady of Kursk, which was finished in March of 1978. And the next month, on the feast of St. Mary of Egypt, something very significant happened—my wife gave birth to our first daughter and we named her Maria in honor of St. Mary of Egypt. We contacted Platina and we asked that one of the Platina fathers come up to Woodburn and celebrate the very first liturgy in our Lady of Kursk chapel and baptize our daughter Maria, and the decision was made that Fr. Seraphim would be the one to come up to Woodburn. Fr. Seraphim had just recently been ordained and I don’t think he had baptized any infants by then. Two weeks later we got word that Bp. Nektary was coming to Woodburn too and he was going to bring with him the wonderworking Kursk Icon of the Mother of God so she could be present there in our chapel during its first Liturgy and Maria’s Baptism. So I had four things going on: the wonderworking icon’s visit, our hierarch would be present, our first Liturgy and a Baptism, so naturally we invited some friends including several from the sizable Old Believer community in Woodburn. Because I was fluent in Russian I made several friends among them and I thought we’d invite them over to be present in chapel to see the Liturgy, to venerate the icon if they so chose and to see how we “Nikonians” baptized infants. Old Believers they are very attentive to the minutia of the rubrics. Sometimes they carry it too far and frankly are pharisaical about it, so I approached Fr. Seraphim with what I thought was a reasonable request, and I said, “Fr. Seraphim, there are going to be some Old Believers in chapel tomorrow morning. Be sure when you baptize Maria that you immerse her completely, three times,” and at this point Fr. Seraphim’s legendary composure slipped. He turned to me and his eyes were flashing and he raised his right hand and he said, “Oh, are you one of those who think that if one little part of the little finger isn’t completely under water that the Baptism is invalid? !” And with that he turned and walked away from me. I was speechless, having never experienced this sort of thing from Fr. Seraphim before. But then it dawned on me, and I thought as a human being he’s concerned about immersing an infant in water. He was probably already full of angst about drowning my daughter Maria in the waters of Baptism. So I rose early to pick up Vladyka Nektary and as we were driving back to Woodburn, Vladyka Nektary sensed somehow that something was bothering me and he turned to me and he said, “Hey Johnny, what’s the matter? What’s eating at you? Tell me” I was surprised but it’s a bishop so I had to tell him the truth, I basically related to him the substance of my conversation with Fr. Seraphim the night before and then added that If Fr. Seraphim didn’t completely immerse Maria, three times, I’d never draw another peaceful breath as long as I lived in that town. Vladyka Nektary took a breath and said, “Don’t worry, I’m going to take care of everything.” And sure enough, when it was time to immerse Maria, Vladyka Nektary moved to Fr. Seraphim’s side and with his left hand on Fr. Seraphim’s hand, he made sure that Maria was completely immersed in the name of the Father, and of the Son, and of the Holy Spirit. And I want to tell you that Maria didn’t cry, didn’t even whimper! It could have been the most perfect Baptism in the annals of Christendom. 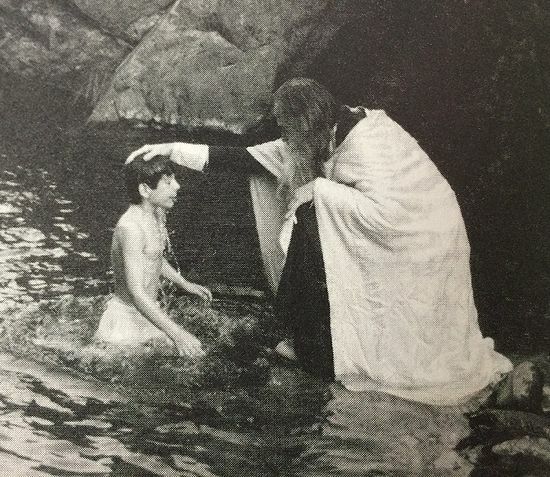 I know it was canonically correct because I’d read the canon, it was the most perfect baptism I had ever witnessed. It came off without a hitch. And right after the Baptism I took this picture in which we see the newly recomposed Fr. Seraphim with a justifiably contented smile on his face. I’d like to think that after that Baptism he was never intimated by dunking a baby again. When it comes to being a Christian there’s a lot of rules and regulations and we’re supposed to strive to live according to a certain standard. Once Fr. Seraphim and I were walking around the monastery, and he made an interesting comment in response to an observation I had made about some priest or bishop who wasn’t behaving according to the way I thought he should behave, and I’ve carried it with me and it’s been very useful. He said, “God’s Heavenly Treasures are stored in earthen vessels,” and I hope that that bit of wisdom coming from Fr. Seraphim that I’ve shared with you now will be as helpful to you as it has been to me. Subdeacon Martinian’s mother, Agafia (also buried at St. Herman’s Monastery), also came to Orthodoxy through meeting Mary in Gospel Outreach. Martinian was baptized by Fr. Seraphim as a child and offers the unique and sometimes humorous perspective of a child observer of Fr. Seraphim. I’m going to go out on a limb and do something that my mom told me I needed to do someday, which is to talk about Fr. Seraphim in a slightly different way. I hope you’ll forgive me if you’re momentarily scandalized but it’s important for us to know that these people that we revere were also human and fallible, and yet remain such objects of veneration and admiration and inspiration and intercessors in Heaven for us. When I first met Fr. Seraphim I was pretty taken aback. I’d never seen anybody with dreadlocks in their beard, I’d never been to an Orthodox monastery, I’d never been in an Orthodox church. It was the fifth week of Great Lent, the church was full of tall men with long beards singing rather slow, sad sounding songs, all the lampadas were red and there were pictures all over the walls of saints, which, coming from a Protestant background was somewhat scandalous. I had a lot of questions but I also felt that there was nothing wrong going on here, so what’s really going on if these things are wrong and this way of praying is wrong but nothing feels wrong. Why is that? I spoke with Fr. Gerasim, who later became my Godfather, and I asked why is the Cross so strange looking? why are there lamps? why are we standing?why are there doors up front? what’s the table inside? and so on, and every answer just kept making sense. And my mom and I began coming up here every few months to get more. At Nativity 1981 I was made a catechumen and received my first prayer book and then the following summer we came up for the pilgrimage and I was baptized. Being a ten year old boy running around in these dusty environments my baptismal garment was an absolute mess and that’s when somebody decided to tell me, “You know, every stain that you get on your baptismal garment represents a sin that you’re going to do,” and I had this really big one right there from watermelon or something, so I knew I was going to need a lot of help. I have vignettes, just little pictures and moments and some of them I didn’t even remember until maybe five years ago when I really started to try to go back in my mind to those early day. And I also want to share a couple that my mom told me about that she felt were important to remember. Whatever Fr. Seraphim did, he did it all the way. He didn’t do anything halfway, although he might not have known exactly how to do it. I watched him swing a hammer and it was sort of a studied ramming with the hammer instead of a parabola where you really get the force of the hammer. It wasn’t that bad, but I could tell he didn’t really know how to do it. As a child I was an observer, and I just watched. I watched Fr. Seraphim at his meals. He seemed to poke his food around a lot and push it into different piles and move it over here, and the reading would be going on, and he’d never look up, and I thought, “I don’t think he’s even listening to the reading,” and the piles would move around and I’d realize he’s not even eating. I have to eat all this, why doesn’t he have to eat all this? He would seem a million miles away. And then during the reading he’d suddenly look up and say, “Actually it was 1947.” There had been a typo in the book or something, or, “No, that was Glinsk.” So you know he really was paying attention. But I remember he’d often sort of be looking off somewhere and then his head would just fall down to the side, and I used to copy that as a kid, thinking, “Wow, that’s contemplation,” hoping something would come to me. It didn’t.But I do remember the first time I noticed that his prayer rope hand was going full force when his head was tilted off to the side, so he really was doing something different even though he was listening and sometimes eating. My mom and I both noticed that there were sometimes many pilgrims here. Everybody loved Fr. 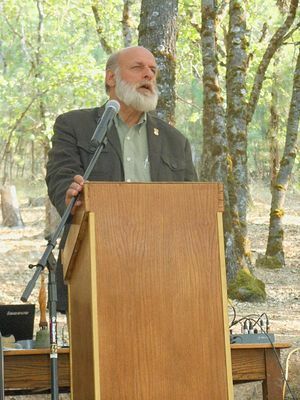 Seraphim and everybody loved Fr. Herman. Fr. Herman was keeping people going and making them feel needed, and he would give all the little kids a job to do so that they’d feel included, but when people needed some quiet time to talk about stuff that was bothering, a lot of them went to Fr. Seraphim. But they were working in tandem. Neither could have functioned as they did without the other. It’s important to remember that Fr. Seraphim didn’t like attention, didn’t like to be treated as something special, and didn’t like people clustering around him to hear a pearl of wisdom. If you had a question—great, but he wasn’t just standing around spouting off things. He was never a guru and he hated that kind of attention. He especially didn’t like when people would try to make him look “better”—fixing his klobuk in church, or fussing about his beard which he obviously didn’t take a comb to, or something like that. And I’m really sorry about this, but it’s true—sometimes when he was standing in front of the Royal Doors praying, he would start picking his nose and quite obviously flick it somewhere. My mom and I talked about it, comparing notes, and we think he was doing it when he knew there was somebody staring at him—he wanted people to stop paying attention to him, and to say their prayers, and look at the icons. It wasn’t about him, but always about Christ. We came up for his funeral and I’d never seen a dead person before, and I was struck by the smell of his hand when I venerated it. It had an amazing smell that’s not easy to describe, but it made me feel safe with a dead guy and I stayed right next to his coffin for a long time. I didn’t want to go away and all these people were coming and going and there’s people crying, and sad music, and a lot of incense. It was all so troubling and a little scary. My mom was sad, and Seraphim and Martha and their daughter were there, and everyone was sad, so no one was really paying attention to me, so I just scooted next to Fr. Seraphim and stayed there. This also relates to how he hated appearances, and trying to make people and things and situations look other than they really were. People started messing with his face, with his hair, and with his cross, trying to arrange the things in his coffin, and that peaceful look that he has in that photograph started to drop away. First his mouth came up just a little bit, and it was just like a nightmare. I was standing there watching this face slowly change, like he smelled something bad, and I just kept thinking, “Just leave him alone. Leave him alone. He wants you to leave him alone.” His face did relax, it was just horrifying. I didn’t blame the people but it was so clear that he didn’t like this messing with him, and I think as the keepers of his memory we should all try to not do that kind of messing with it. It’s really important. As I said, he never did anything halfway. One day in winter there were a couple of other kids here and there was snow everywhere and of course kids and snow do things together, so we started stockpiling ammunition for the inevitable war that would break out. Fr. Seraphim came walking by and saw these piles of snowballs and said, “Don’t you dare throw those inside the monastery,” so he helped us move them outside the monastery walls. Once they were outside we looked at them and he looked at them and then he picked up a snowball. He was like a Major League pitcher—he took that snowball and hurled it and it smacked a tree and were just like, “Wow!” and that was it. He was done and he walked off, but watching him throw that snowball was so different from anything else we’d seen him do. He was coordinated, he was dynamic, and he hit the tree right in the middle like a bull’s eye. It was like a ninja, and it was such a consolation to know that he was a real guy too. Being a kid, I often didn’t want to look at him because he was so intense, with these bright blue eyes. I remember when I found out that Fr. Seraphim would be baptizing me. I had been hoping that Fr. Herman would do it, and so when I found out i was feeling kind of disappointed and embarrassed that I felt disappointed. We were talking about how the Baptism would go, and wanted to want him to baptize me, but I wasn’t feeling it, and so I was shy and quiet, and I could tell he was waiting for me, so I slowly built up the courage to just look at him and see what was there, and he was looking at me with so much loves in his eyes that it took me completely by surprise. He didn’t really even know me that well, but he really loved me. When he was giving talks I’d be off playing somewhere, and thought maybe he wouldn’t think I’m ready, but there was nothing like that. He was so deep, and so real, and wanted nothing in return. You know how grownups look at you when you’re a kid and they’re hoping you’ll smile back or just show some reciprocal delight or something? There was nothing like that and I just knew that he loved me, and that’s why I wanted him to baptize me. Fr. Alexey Young, later to take the name Ambrose in monastic tonsure.